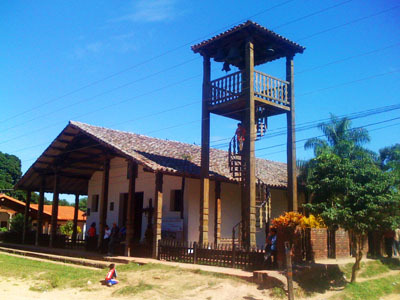 20 kilometers to the west of Santa Cruz and next to the Piraí river one comes across the small town of Porongo. Porongo is also one of the nine municipalities that make up Amboró National Park. This historically coffee producing area still processes some of the best coffee in the region. This picturesque town bears the name of a wild jungle fruit and offers visitors a range of options to enjoy the surrounding pristine wilderness. 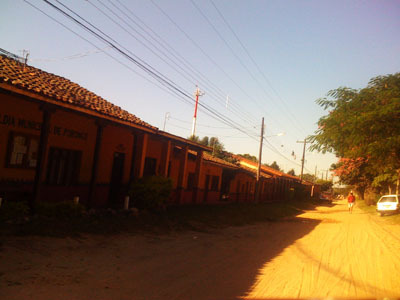 Porongo, although a tiny rural town, has electricity, clean drinking water, telephones and ample transportation services. The town has maintained its colonial style which is embodied in the main plaza and its numerous old homes. 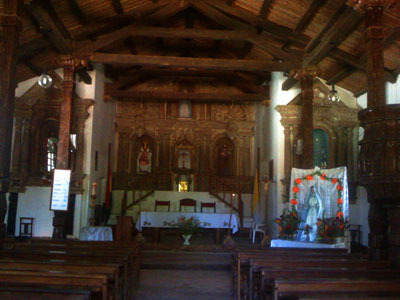 The old San Juan Bautista church dates from 1716 and is considered one of the lastJesuit mission constructions in Bolivia. This church was recently declared a national historical monument by the Bolivian Government. Even today the church has its original bells and baptism tub made by the Porongo locals hundreds of years ago. Every year according to the liturgical calendar on June 24th the celebration of Saint John the Baptist is held where locals honor this patron saint with plenty of sporting competitions and traditional foods.